Rose Heilers sat on the window sill of her second floor bedroom of the Harvey House in Slaton, Texas. She leaned against the glass so she could see further down the railroad track below. Since meeting Bill Farschon, a railroad man, a few months ago this is how she has spent many of her late evening hours – waiting for Bill. She smiled at the thrill of watching the train approach the depot, first just a small, dark dot on the horizon. As the dot grew larger she could hear the “clackity-clack” of the wheels on the steel track. The passenger train whistled as it crossed the final intersection before it slowed and rumbled into the train yard below. Rose could actually see Bill’s face when the train passed the smokestack beside the tracks. He was usually smiling. She liked to believe that he knew she was waiting for him and the smile was meant just for her. With the screech of brakes and a great puff of steam, Bill was home. This description of a Harvey Girl overlooking the rail yard waiting for the man she loved is my fictionalized version of the story of a real Harvey Girl. Following is an excerpt from my book, Harvey Houses of Texas (The History Press, 2014) that tells the true story of Rose Hielers who lived on the second floor of the Slaton Harvey House and “fed the trains” in the restaurant below. While spending the summer of 1936 in Slaton with her aunt, twenty-one-year-old Mary Rosina “Rose” Hielers heard there was an opening for a waitress at the Harvey House. Her Aunt Mattie recommended Rose for the job, and she was hired. Rose left her home and most of her family in Stratton, Nebraska, to become a Harvey Girl. As with most Harvey Girls, Rose discovered working for Fred Harvey was a pleasant experience and was much more rewarding than her job as a sales clerk in the general merchandise store in Nebraska. Her hours there had been long, and the pay was meager. At the Harvey House, all of the employees were congenial, and the family atmosphere made being so far from home much easier. There were about twenty employees at this restaurant and newsstand, including the manager and his wife. The Harvey Girls lived on the second floor, and the manager’s wife acted as their house mother. Male employees lived in a separate building. A job at the Harvey House was a special blessing, as jobs of any kind for women were hard to find in the mid-1930s. The young women were paid one dollar a day plus tips and received free room and board. They also enjoyed laundry service and received a pass to ride the Santa Fe anywhere in the United States. All of these benefits plus her salary were equal to twice as much as Rose’s previous income. “To be a Harvey Girl, you had to have good morals and be reasonably attractive,” Rose said. “You had to be modest and well mannered.” She also explained that a little bit of lip color was the only makeup allowed, and jewelry was not allowed. Rose met Bill Farschon on a blind date. They were married over sixty years before Bill passed away in 2002. Rose died 6 years later. She was a member of St. Joseph Catholic Church, the Altar Society and a charter member of Catholic Daughters. 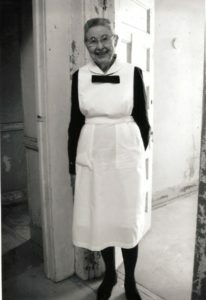 After restoration of the Harvey House in Slaton, Rose donated many personal items from her Harvey Girl days and enjoyed wearing a replica of her original black and white Harvey Girl uniform for special events. Respected and loved by all who knew her, Rose Heilers Farschon is a fine example of the positive influence Harvey Girls had in the communities where they worked and lived. These women truly civilized the West!